DR. PHOEBE DEVITT, a native of Soldiers Grove, has come back home to practice medicine in the family tradition. POSTED February 6, 2019 2:07 p.m. 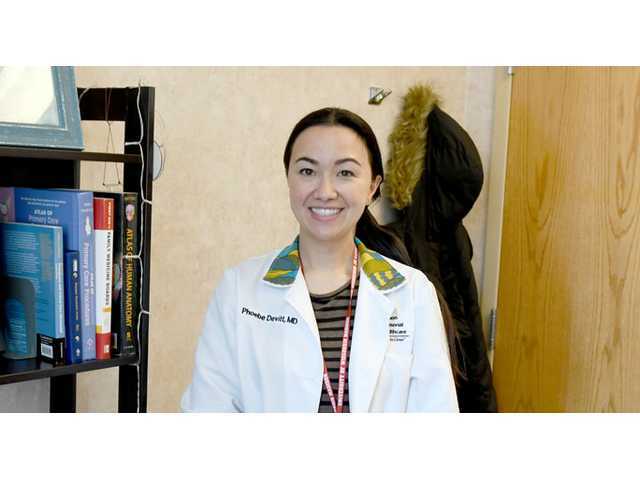 SOLDIERS GROVE - “I was born in this hospital,” the smiling young doctor told me from behind her desk at the Hirsch Clinic in Viroqua last week. Well of course she was. Dr. Phoebe Devitt is the daughter of Dr. Tim Devitt and Emily Devitt, a registered nurse. Dr. Tim Devitt took over running the Kickapoo Valley Medical Clinic in Soldiers Grove in the 70s. He also practiced at Vernon Memorial Hospital. The Hirsch Clinic is located in that hospital, which is now called Vernon Memorial Healthcare. Tim retired from his practice a few years ago. Nurse Emily Devitt worked at the clinic and at the hospital, where she is still employed on the medical-surgical wing of VMH. Dr. Phoebe Devitt and her husband, Dr. Joel Charles, arrived here about a year ago after completing their residencies in Santa Rosa, California. Both doctors were part of a residency program that focused on training general practice physicians. Upon their return to the area, the couple moved into the Devitts’ house on Trout Creek Road north of Soldiers Grove. It’s the same house in which Phoebe grew up. When Dr. Phoebe Devitt went to work at the Hirsch Clinic in Viroqua, her husband went to work at the Kickapoo Valley Medical Clinic. “He’s got my old job,” Dr. Tim Devitt joked of his son-in-law’s position at the local clinic. While it’s true Phoebe grew up on Trout Creek Road and attended North Crawford Schools, there’s a bit more to that story than initially meets the eye. Yes, Phoebe was good student, who participated in volleyball, track and the high school band at the local high school. Her very first job was working for VMH cutting the grass at the Kickapoo Valley Medical Clinic, which had been purchased from her father. She also worked as a dietary aide at the Sannes Skogdalen Nursing Home in Soldiers Grove. Although Phoebe spent her whole life living in a rural setting in Crawford County, she was convinced that she was a city girl at heart. The North Crawford High School Band’s trip to New York City served to solidify that belief. All through high school, Phoebe knew she would attend school in a big city. Upon graduation in 2004 she moved to Milwaukee, where she attended the University of Wisconsin-Milwaukee. At first, she was enamored of her new life in the big city. However as time passed, she became less enthusiastic about it. As she walked to school from her apartment, she began to notice the lack of green spaces. The constant noise from sirens, which were largely ignored by the urban population, never quite stopped alarming the girl who grew up on Trout Creek Road. “I guess I needed to move to the city to figure it out,” Phoebe said. Her decision about where she wanted to live was changing. However, true to her nature, Phoebe Devitt stuck it out. She majored in pre-med and graduated in 2009. Along the way, she spent a semester abroad in Seville, Spain. In college, Phoebe became a Certified Nursing Assistant and worked at a nursing home and in a group home. Following her graduation, she returned to her parents’ home. She got a job as a CNA at Vernon Memorial Healthcare and worked in the same unit as her mother Emily Devitt, the registered nurse. Emily recalled that although she and Phoebe did not typically work on the same shift, they did work together at Christmas that year. After a year-and-a-half of living back home, Phoebe applied for and was accepted to the Medical School at the University of Wisconsin-Madison. She entered a program called WARM (Wisconsin Academy of Rural Medicine). WARM’s emphasis is on training med students to be primary care physicians in rural areas. In medical school, Phoebe Devitt met Joel Charles. After graduation in 2014, the two were accepted for a residency program in Santa Rosa, California. In Santa Rosa, the residency program worked to get them the kind of broad spectrum of experience they would need to work as general practitioners in rural Wisconsin. Phoebe explained that much of the work in Santa Rosa involved working in clinics and working with the Hispanic community. Many of the patients were uninsured or underinsured and some undocumented. Phoebe also did obstetrics in Santa Rosa and has continued OB practice at VMH. She delivered 10 babies last year. While Phoebe definitely values the medical experience that she found in Santa Rosa, she was less than happy with having to live in the city again. Her views of urban life had definitely changed. On Christmas Day in 2017, Phoebe and Joel arrived at Trout Creek Road to start their professional careers in rural Southwest Wisconsin. The couple is looking forward to building their own house on her parents’ Trout Creek Road property. They plan to start construction this summer. Last summer, the young couple was blessed with the birth of their son Finn. While Joel and Phoebe are taking over the roles of doctors like Tim Devitt, Ben Agar and others, there are some differences. The medical profession has reformed itself to offer some respite to this generation of doctors that the previous generation didn't enjoy. When Dr. Tim Devitt worked at the Kickapoo Clinic with Dr. Bill Calkins it was a 50-50 split. Each doctor did hospital rounds every other day and every other weekend. Now, Phoebe and Joel are on a five-to-seven-week rotation with several other doctors from the other clinics that allows them to do just one week of in-patient, on-call work at the hospital with rest of the weeks covered by someone else. Phoebe said burnout and the early retirements of doctors led to this change. One thing is certain, having Dr. Phoebe Devitt and her husband Dr. Joel Charles working here is a positive development for them and the community they serve. “I’m looking forward to settling down and not having to move across the country anymore,” Dr. Phoebe Devitt declared. Dr. Tim Devitt pointed out that his father practiced medicine in Milwaukee, making Phoebe the third generation of physicians in the family. The elder Devitt wondered aloud if Phoebe and Joel’s five-month old son, Finn, might become the fourth generation of doctors in the family. VMH may be equally pleased with the outcome. Phoebe’s mother said she was ecstatic to have her daughter and her family move back to the area. “I’m very happy and very proud that she came back to work in the place where she was born and raised,” Emily said. Both Tim and Emily noted that the young couple loves the outdoors and living here is a perfect match for them. When they’re not working, Phoebe and Joel enjoy birding, biking and backcountry camping among other things. Welcome home Dr. Phoebe Devitt!